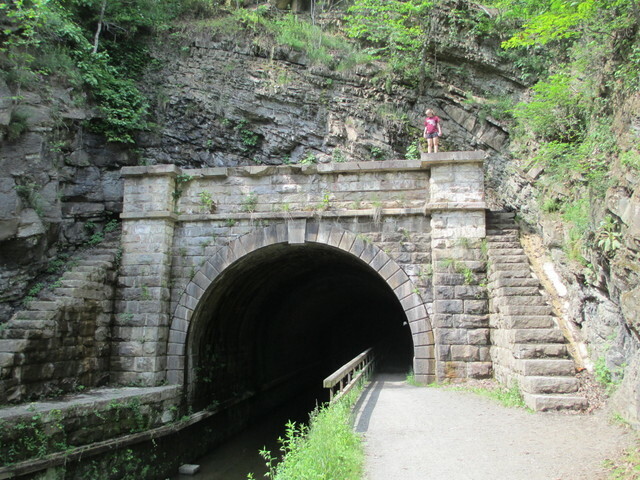 Wednesday after the canals, we went to the Paw Paw Tunnel, also on the old C&O canal system. 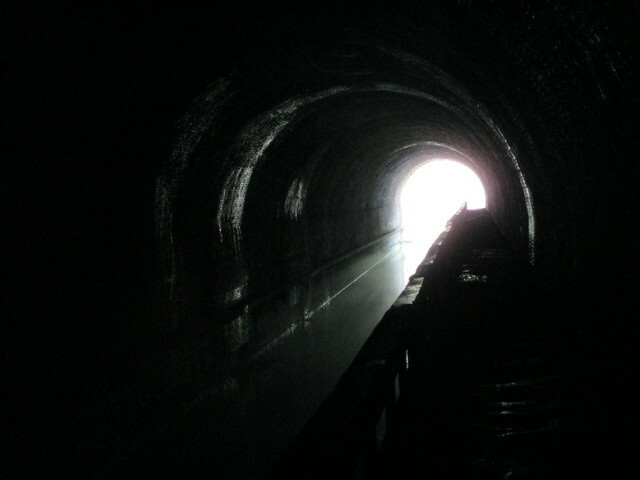 It’s an unlighted 3000′ tunnel with a walking path — presumably the old mule tow path, which couldn’t have had a guard rail when it was in use, which is fascinating to consider — beside and above the now unmaintained waterway. Lydia missed the signs telling you not to climb the stairs at the tunnel entrances because they’re worn and dangerous. I expected it to be darker than it actually was. If you think about it, you can easily see a bright light that’s large and less than a mile away, and both tunnel entrances were clearly visible all the way through. The path, however, was not visible without flashlights. And it was interestingly textured with concrete plus mud plus other water deposits plus dripping cold water plus puddles. On the east end, I went a ways down the boardwalk and watched the watersnakes playing — definitely a disincentive for thinking about walking back through the tunnel in the cold canal in the dark like you’re not supposed to. Then walked back through on the path like I was supposed to.